This information kindly provided by Simon O'Sullivan. For an approximate location map, click here. Witney Lake is a flooded gravel pit which has been purchased by Witney Town Council as part of the Witney Lake and Meadows project. The area includes wet meadow and grazing land adjoining the two legs of the River Windrush to the south and north of the A40 trunk road. The southern end of the lake is managed as a nature reserve and the grazing land to the east and north is classified as an Environmentally Sensitive Area. Ducklington village lies to the west and between the lake and there are small paddocks and allotments. The paddocks are grazed and are bordered by some mature Oaks and pollarded Willows although there are signs of encroaching development at both the north and south of the village. The lake is very deep throughout and so lacks any shallows or muddy edges. 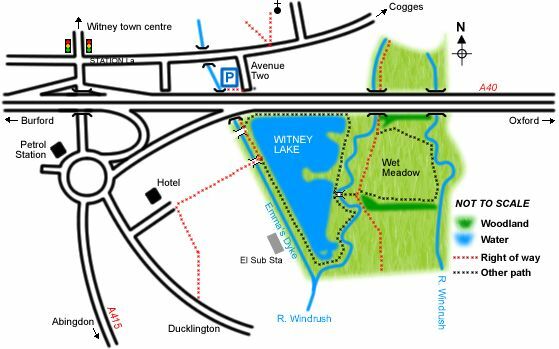 The site is situated within a mile of Witney town centre and so is well used by the general public and particularly dog-walkers - a sunny Sunday afternoon is not recommended! The northern end of the lake and the river are also fished although the close season is still adhered to. The lake itself is surrounded by a very good path but obviously the other areas can get very muddy and the path itself is prone to flooding during wet weather in winter. As there are more productive sites within a few miles, such as Dix Pit and Farmoor, this area is seriously underwatched. From A40 Oxford/Cheltenham or A415 Standlake/Abingdon: Head towards Witney and turn right into Station Lane at the first set of traffic lights. Take 2nd right after c. ½ mile into Avenue Two, follow this to the end and park here. From A4095 Long Hanborough/Bicester: Head towards Witney and cross straight over 3 mini-roundabouts towards town centre. At the traffic lights turn left and go straight on at next two roundabouts (past Waitrose and Sainsbury's on your right) and take the left into Avenue Two (opposite bowling green and tennis courts). Follow this to the end and park here. By foot/cycle from town centre: From the Market Square head south past the Buttercross and Church Green and head to the right of St Mary's Church through the gate on the path that runs alongside (regular Spotted Flycatcher site). Beyond the church is the Leys recreation ground; follow the path straight ahead which runs to the left of the children's play area, cross Station Lane at the traffic lights, and turn left into Avenue Two. Follow this to the end and take the small path that runs under the A40. Alternative route from town centre: Follow Langdale Gate from Buttercross and cross Witan Way. Follow path by electricity substation, cross the bridge over the first stream and follow this stream to the right. Continue along here until you reach a gate with information board and follow the path around and under the A40 to reach the lake area. All of the area owned by the Council is accessible and there are public footpaths connecting with Ducklington and Witney. Resident: Little Owl, Kingfisher, Barn Owl, Great Crested Grebe, Buzzard, Grey Wagtail, Reed Bunting. Winter: winter thrushes, Siskin, Redpoll, Water Rail, Snipe, Stonechat, Golden Plover. Summer: Cuckoo, Sedge Warbler, Whitethroat, Lesser Whitethroat, Garden Warbler, Blackcap, Willow Warbler, Common Tern, hirundines. Spring/Autumn: Whinchat, Wheatear, Redstart, Hobby, Spotted Flycatcher, Common Sandpiper, Yellow Wagtail. Park Ranger Nigel Boden (01993 704614), or Town Hall (01993 704379). A booklet Birds of Witney Lake 1994-1996 is available from Witney Library or from OOS. It includes a walk route and species status checklist. Nearby sites Stanton Harcourt / Hardwick / Standlake gravel pits. Simon O'Sullivan. Simon would be pleased to hear of any unusual sightings as he has been covering this site now for six years. The species total currently stands at around 115 and he can provide a full list for anyone interested. Please contact Simon by email.